Permanent Makeup is an affordable way to enhance facial features. Permanent Makeup is an affordable way to enhance facial features. It is a state-of-the-art procedure that is medically proven and completely safe. This cosmetic technique deposits micro insertions of natural, non-iron oxide pigment into the dermal layer of the skin. Whether you like a soft, natural appearance or a defined, dramatic style, we will meet your expectations. Similar to the lip color of a newborn baby, is popular for those more dramatic color can be achieved, if desired. The procedure for eyebrows can mimic the appearance of hair in the brow line. Anyone who desires more fullness of the brows will love the procedure and the time saved not applying makeup. Those who used to apply makeup pencil can go swimming, play tennis, or wipe their forehead without the embarrassment of losing any part of their eyebrows. Alopecia sufferers are pleasantly surprised at how natural the treatment looks. A subtle, natural look, mimicking thousands of tiny eyelashes with the implantation of pigments in the lash line is popular with both male and female clients. Additional shadowing of color can be added for a soft, natural liner or a bolder, defined line can be achieved. Ophthalmologists recommend Intradermal Cosmetic procedures for those who are allergic to conventional makeup and for those wearing contact lenses. This procedure adds color to the inner mucosal tissue (aka wet line) just below the eye, and will complement your eye’s natural sparkle. The coloring of the mucosal tissue adds depth, and vibrancy. Who is a good candidate for permanent makeup? Depending on the person, topical anesthetics are used to minimize discomfort. Yes. 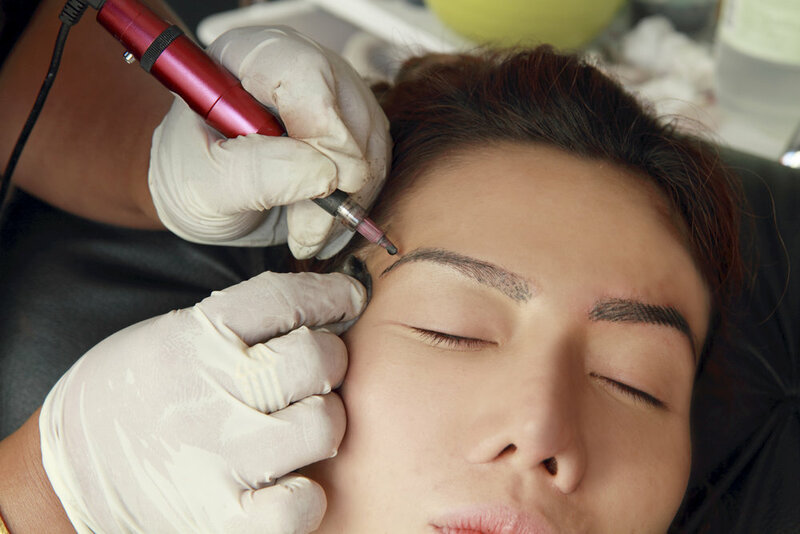 Permanent Makeup has been popular in Asia for the last 30 years and has been in the United States for the last 15 years. We only use disposable products. Absolutely! There is a broad range of colors from which to choose or bring your own lip liner/color and we will match it! The actual procedure time is approximately 30-45 minutes. However, please allow about 30 minutes to an hour extra to include preliminaries, such as establishing a design that will fit your face symmetry and creating the individual color formula. There will be mild swelling and redness accompanying the procedure, which will subside quickly. You may resume normal activities immediately after the procedure. Complete healing takes one to six weeks while the pigmentation matures and reaches final color. Some people do, but, it is not necessary. I had my permanent makeup done by another technician, however I am not able to locate her and I need a touch up. Can you redo for me? Yes, of course. We will be happy to discuss your options. Please know that true touch-ups from another technician will be charged at 1/2 of our regular price. This means that your previous work does not need any reshaping or color corrections. Please call for a consultation to determine if any new work is required to achieve your desired results. May I have more than one application of permanent makeup? There is no limit to the amount of times you can have permanent makeup applied. How long will the PMU last? Permanent Makeup will soften in saturation with time. The rate of the fading is determined by your skin (oily or dry), exfoliating agents, the sun, the original depth of implant, type of pigment, etc. We recommend a touch-up (also known as a "color boost" or "retouch" every few years). Allergic reactions to pigment are not common; however a patch test can be done prior to the procedure. Keep in mind, allergies can develop at any time. A popular reason for getting Permanent Makeup is the allergies to cosmetics.